Mmmm...brownies...yum. 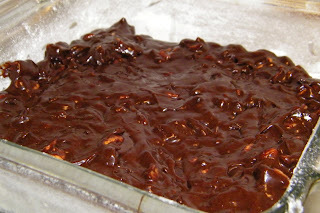 Brownies with espresso powder, cinnamon, chocolate chunks, and pecans...YUM! This week's Tuesdays with Dorie pick was Tribute to Katharine Hepburn Brownies, chosen by Lisa of Surviving Oz. Lisa is not a regular TWD baker, but she recently won the TWD logo contest so she got the honor of making this week's choice. omg, you should read her blog...she's hilarious! 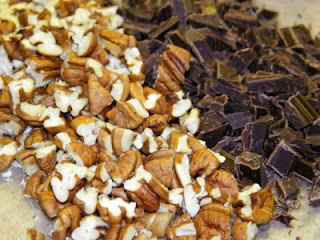 Now, on to the brownies! I'll admit, mine are still baking away in the oven, but I wanted to get my blog post in while it was still technically Tuesday, and if I don't do it now while I have a chance, well it might never get done!! According to Dorie, this makes a thin, soft gooey brownie. Doesn't that just sound sinful? :) It's actually made without much flour at all, which sounds intriguing to me. I'm anxious to see how they turn out. Here comes the hard part...the waiting...I have to let them cool for 30 minutes in the pan after baking, then I am instructed to let them cool completely. mmmkay, we'll see how that goes. 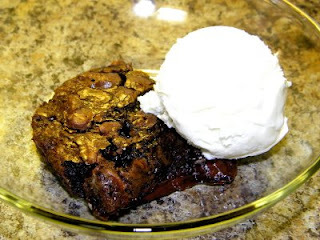 I'm envisioning a warm, gooey brownie topped with what little remains of the vanilla bean ice cream from Saturday. I will certainly come back and report how they fare in my house. I have a feeling Sean won't like them because of the nuts, and D may not like them because of the gooey-ness (and the espresso powder that I am not telling him about!). But I can't wait to dig in! Be sure to check out what all the other TWD Bakers did with this recipe!! Update: oh my sweet ooey-gooey-chocolatey-nutty-coffeeish heaven! Wowsers. Can you tell I liked them? Okay, well let me 'splain. First off, I'm not entirely sure they were done. I mean, I know they're supposed to be gooey and all, but mine were super gooey. However, I didn't exactly let them cool after I turned them out of the pan. We'll see how they are when they cool. D swears I was eating raw brownie batter. Which of course meant he certainly wasn't going to try it. I didn't care, personally. It was just delish! And with a scoop of homemade ice cream on top...excuse me while I moan with delight! I might also add that I baked it in an 8x8 glass dish, so I did decrease the temp by 15 degrees and baked it the instructed cooking time. I used espresso powder instead of the instant coffee the recipe called for, but didn't notice an overwhelming coffee flavor, as some others did (but then again, I'm a coffee addict). I did cut the cinnamon by half, just because my cinnamon seems quite strong. I think it probably would have been fine at full strength though. Thanks for stopping by my blog and commenting. Cute blog with the Alphabet Soup! yum, HELLO? Where is MINE? I would like ice-cream with the brownie, please. I think it looks perfect with that scoop of ice cream. I'm so glad you enjoyed them. This was a really delicious treat! They look gooey, not raw! Very tempting with the ice cream! I didn't think the coffee was overwhelming either.